Zooniverse held it’s second annual conference for new project scientists a couple of weeks ago, where we introduced them to the process of building a successful online citizen science projects. This intense two-day event bombarded new recruits with a ton of information relating to data reduction, web development technology, design and of course education. Zooniverse projects have immense outreach potential, the expertise and experience that the team has collected over the years lead to complex and often intimidating science being simplified for a general audience. If you have yet to be convinced by this process, check out SpaceWarps. The hunt for the warping effects on the light from distant galaxies, caused by huge foreground galaxies acting as lenses, has been transformed into a two minute tutorial and a couple of clicks. The projects become a tool for science teams to share their research with the public, their funders: The Tax Payers. Better still, beyond sharing their research they can ask people to participate and what better way is there to engage the public? Taking this a step further though, many science teams do wonder what, if anything, they have to offer for more formal education settings? Formal science education in the US is about to undergo some changes with the impending adoption of the Next Generation Science Standards (NGSS). Twenty-six states were involved in the development of these standards, which have a heavy focus on inquiry based learning, and more have signed up to implement the use of them. Their recent release has cause some excitement in the Chicago Zooniverse HQ, as they very specifically call out large data sets online. There is also a move away from the outdated and laughable idea of a linear scientific method, towards a far more realistic concept of three spheres of activity for scientists and engineers. When using Zooniverse projects in an educational setting it is a struggle to fit them into the pigeon-hole boxes of the linear scientific method. Perhaps because they are in fact real science projects and not simplified lab experiments designed to train children in the so-called scientific method. The spheres of activity are much more representative of the circular, back and forth process that most researchers recognize as science. Particularly, in the modern world of large data-sets and massive international collaborations, where many researchers only work on a small pieces of large puzzles, not unlike Zooniverse volunteers. Their piece of the puzzle is just a bit smaller! Zooniverse projects already ask volunteers to take part in several of the practices identified in the spheres of activity. They observe, they measure, they analyze. In our discussion tools and forums they ask questions, argue, imagine, reason and often critique! The recent addition of the Navigator classroom tool to Galaxy Zoo will provide more opportunity for students to undertake more of the practices from ‘Evaluating’ and ‘Developing Explanations and Solutions’ spheres. They’ll be stealing our tagline next. April was a very busy month is the world of Zooniverse education. Here are a few highlights and photos. 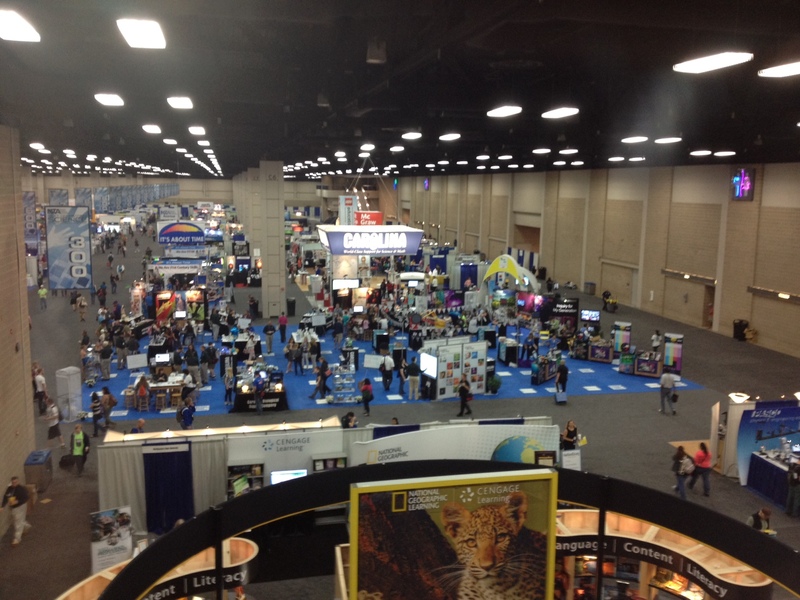 We attended and presented at the annual National Science Teachers Association Conference in San Antonio April 11-14. Most conversations focused on the recent release of the new US Next Generation Science Standards (NGSS). Educators from all walks of life took some time to learn all about this exciting new development in science education. Getting up to speed on these new standards is definitely on our list of summer to-dos. 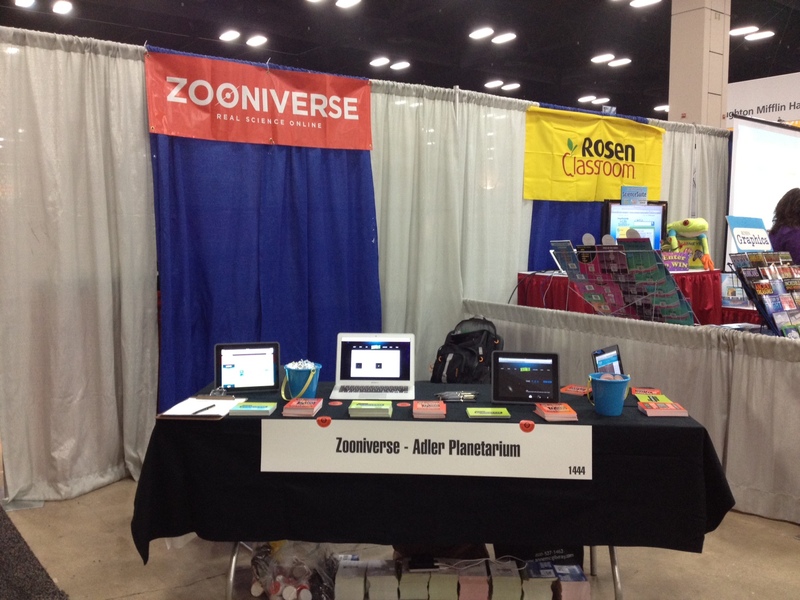 We spent most of the conference at our booth in the exhibit hall having great conversations with teachers about current Zooniverse projects, ZooTeach, the Galaxy Zoo Navigator, and the upcoming Planet Hunters Educators Guide. While not mingling with science teachers you can bet we took advantage of Texas-sized desserts (yes, that cinnamon roll was delicious). 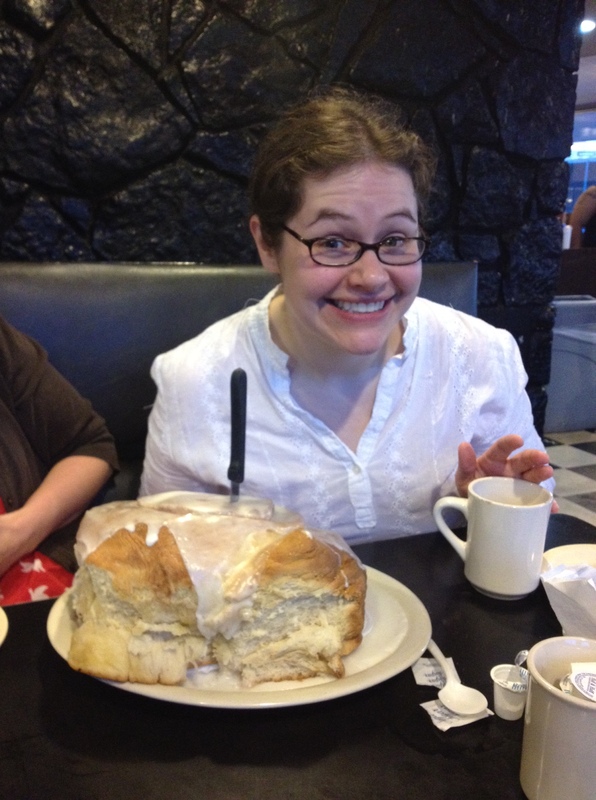 Largest Cinnamon Roll in the USA. 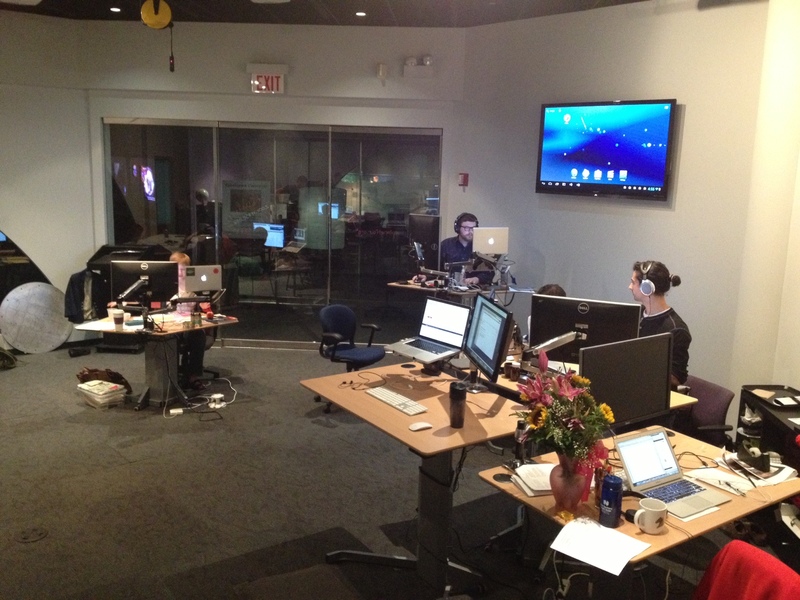 The Chicago branch of the Zooniverse development team outgrew its office. We’ve recently moved into new digs on the museum floor. Not only is there more room, but we’re across from the classroom where field trip programs happen at the Adler! Seeing students engaged in science learning is a great motivator here at Zooniverse HQ. April 29th-30th saw fifty-five scientists, developers, educators, designers, moderators, and citizens science enthusiasts gatherat the Adler Planetarium to discuss all things Zooniverse. This meeting serves multiple purposes, first and foremost it’s a terrific opportunity to have face-to-face conversations with people usually dispersed around the globe. Even with Skype and Google Hang-Outs, sometimes you can’t beat sitting down and talking over a coffee. Secondly, this meeting is a great opportunity to bring science team members behind upcoming projects into the Zooniverse fold. In his talk entitled Lifecycle of a Zooniverse Project, Rob Simpson gave the science teams behind upcoming projects a crash-course in what to expect over the lifetime of their project. The development team used this meeting to begin conversations with these science team members about the design and implementation of their projects. Not to give too much away, but there are some AMAZING projects in the pipeline). 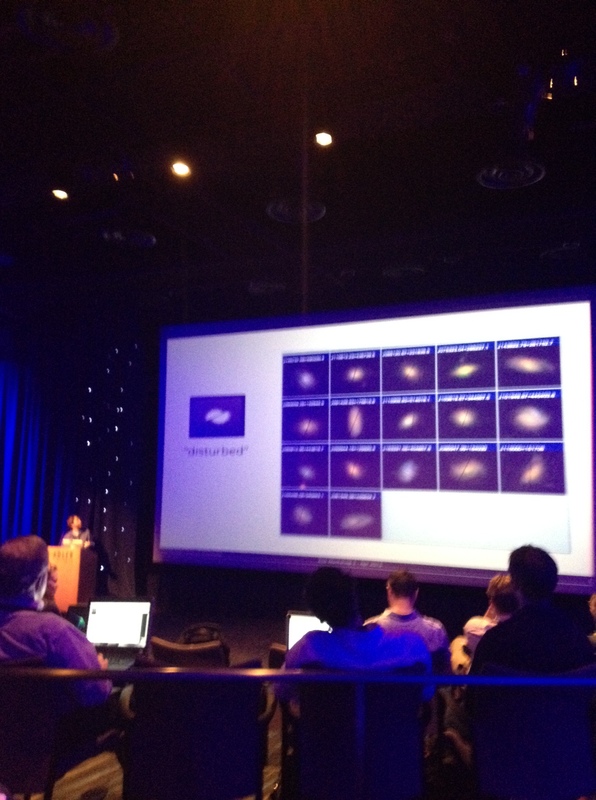 Kyle Willet giving a case study of Galaxy Zoo and at Zoo Workshop 2. Stay tuned for more from Zoo Workshop 2…. 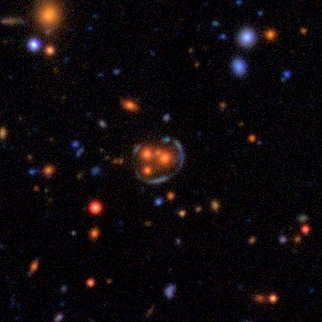 Gravitational lenses – or ‘space warps’ – are created when massive galaxies cause light to bend around them such that they act rather like giant lenses in space. By looking through data that has never been seen by human eyes, our new Space Warps project is asking citizen scientists to help discover some of these incredibly rare objects. We need your help to spot these chance-alignments of galaxies in a huge survey of the night sky. To take part visit www.spacewarps.org. Gravitational lenses help us to answer all kinds of questions about galaxies, including how many very low mass stars such as brown dwarfs – which aren’t bright enough to detect directly in many observations – are lurking in distant galaxies. The Zooniverse has always been about connecting people with the biggest questions and now, with Space Warps, we’re taking our first trip to the early Universe. We’re excited to let people be the first to see some of the rarest astronomical objects of all! The Space Warps project is a lens discovery engine. Joining the search is easy: when you visit the website you are given examples of what space warps look like and are shown how to mark potential candidates on each image. The first set of images to be inspected in this project is from the CFHT (Canada-France-Hawaii Telescope) legacy survey. Computer algorithms have already scanned the images, but there are likely to be many more space warps that the algorithms have missed. We think that only with human help will we find them all. Realistic simulated lenses are dropped into some images to help you learn how to spot them, and reassure you that you’re on the right track. Previous studies have shown that the human brain is better at identifying complex lenses than computers are, and we know at the Zooniverse that members of the public can be at least as good at spotting astronomical objects as experts! We’re going to use the data from citizen scientists to continuously train computers to become better space warp spotters. This is a really exciting project and you can read more on the Space Warps blog. As with our other projects it can also be found on Twitter (@SpaceWarps), on Facebook and you can discuss any interesting objects you find on Space Warps Talk. We’re really excited about this project and think you’ll be able to make some amazing discoveries through it.